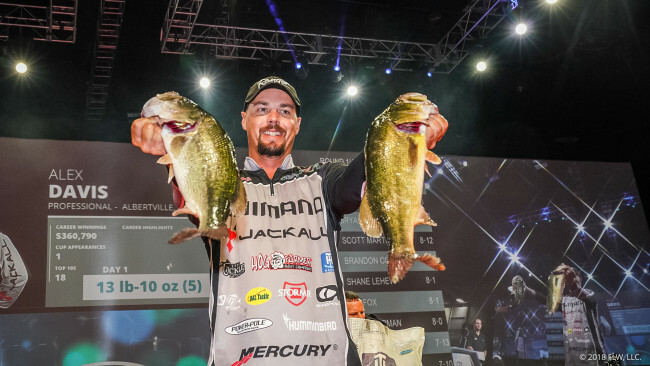 IBASSIN: 2018 Forest Wood Cup Lake Ouachita Day 1: Alex Davis Leads with 13-10lbs! 2018 Forest Wood Cup Lake Ouachita Day 1: Alex Davis Leads with 13-10lbs! Alex Davis best them all on difficult first day. Alex Davis was talking with his dad, Jeff, before the Forrest Wood Cup about who was going to win it. He’s not lying. The Albertville, Ala., pro went from a single 1-pounder at noon to a day-one-leading 13 pounds, 10 ounces through a comedy of randomness. Setting the scene, Alex figured he had some solid stretches where he could catch them shallow on topwater, and they certainly showed they were there, as he had seven blowups throughout the morning. He only landed the lone dink, and he lost another three on a worm. “I have no idea how,” he says. Finally, he made a move and caught a pair of small fish. Another move prompted a fourth. However, there was still a little time left before the 33-year-old had to check in. He decided to stop on one more area. First cast he caught a 3-pounder on something “special” he didn’t want to discuss until tomorrow. Again, he was “done,” but he still had a little time left. So with 10 minutes to go he stopped at a random cove he’d never even been in before. Obviously, luck can be fickle, so when it comes to day two the pro has “no idea” what he’s going to do or how well. Josh Bertrand Wins 1st Elite! Clent Davis Wins 2018 Forrest Wood Cup!